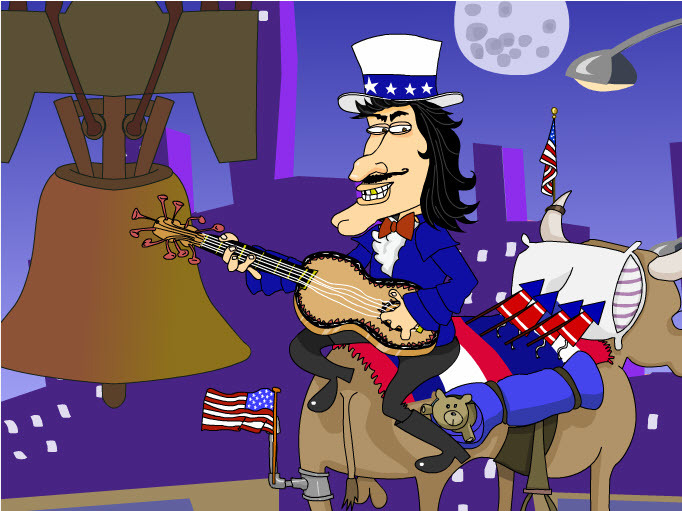 Fourth of July - "The Psychick"
Fouth of July "Singin' Cowboy Bob"
Happy 4th! Or as certain members in our family call it, "Happy Independence Day!" And you know WHY they call it that?! Because they just have to be different than everybody else, THAT'S why! Sheesh! Why can't they just go along to get along? After all, isn't THAT what the Fourth of Independence Day is all about!?? No matter what you call it, we here at Rubber Chicken Cards hope you enjoy the forth day in the month of July. Unless you are like our dogs, then you will probably be spending it hiding under your bed. But even that is its own form of celebration...and it's a good way to clean out any dust bunnies you find. Perhaps you are one of those poor souls who live in a place where there are no fireworks displays. In which case, you'll probably have a very tranquil and quiet Fourth of July. Well, to that we say, "When fireworks are outlawed, only outlaws'll have fireworks!" We probably are remembering that wrong, but either way, and no matter what you call the holiday, it is the one day of the year when people take time out of their busy lives to celebrate the birthday of the United States by creating A LOT of smoke: whether that's from a barbecue grill in your backyard with friends, at a city-sanctioned fireworks display or standing too close to my Aunt Linda as she chain-smokes her unfiltered Marlboros. Let's start a new tradition: Forget keeping the garden hose always at the ready (in case things get out of hand), and instead, email your friends and family our funny, Rubber Chicken Fourth of July eCards. We design each RCC 4th of July card to be "Safe For Work" (imagine there's a winky face emoticon here). And just for you these special Independence Day wishes are (that's how Yoda would say it)! And IF Yoda wasn't such a cheap-skate (it's not his fault, Lucas rendered him that way), Yoda would send out Rubber Chicken 4th of July Cards to each of his friends, he would! So this year, instead of worrying about getting burned by those pesky sparklers or annoyed by our own personal nemesis, those incredibly loud, screechie, noise maker things, and by that we mean our boss, Steve (winky face, please don't fire us). Send those you care about a REAL independence virtual delight --one of our fabulous eCard greetings. They make an impression that lasts longer than the smell of burning sulfur those horrible "ground bloom flowers" leave on your sidewalk. For your viewing pleasure we have a number of our characters giving voice to your inner thoughts. Louise brings heaven into the mix while Stinky Dog puts a little snark into the bowl. Have fun and may you get a kiss out of the bargain, and maybe more.